When I lived in Ohio I had the great honor of being introduced to Dr. George Uetz at the University of Cincinnati. 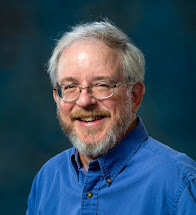 At the time he had a graduate student, Dave Clark, who was doing research on the courtship behavior of the Dimorphic Jumping Spider, Maevia inclemens. 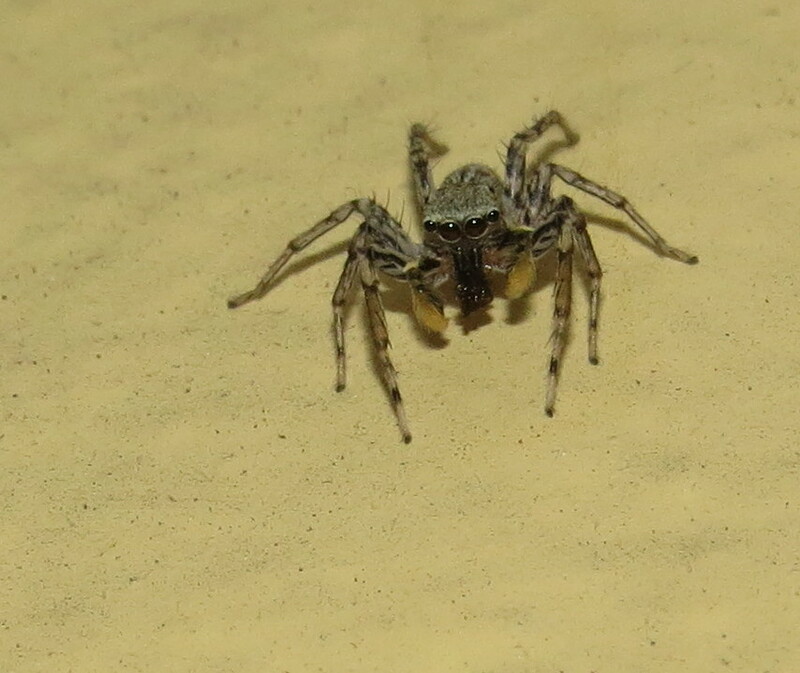 Ever since then I have had a special place in my heart for this unique member of the Salticidae. What makes this spider so special, you ask? The name says it all. The male of this species comes in two distinct forms: a "tufted form" that is all-black with white legs; and a "gray form" with black pinstripes and orange spots and chevrons. 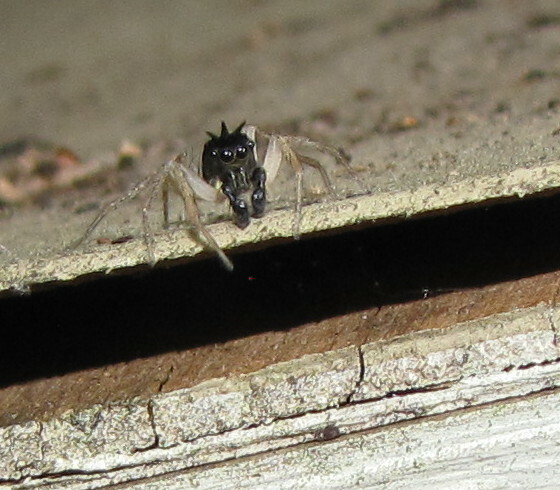 Not only do they look like separate species, but they behave like two different spiders, too. Each male performs a complex dance that is different from that of the other form. The tufted form, named for the triple-Mohawk style hairdo, literally stands on tiptoe, dips his abdomen, and waves his front pair of legs overhead at a prospective mate. The gray form takes a "low rider" position and sidles back and forth. Dave Clark capitalized on those differences, as well as his expertise in video, and created animations of a tufted form male doing a gray form dance, and vice versa. He then played his mixed-up dance mix in front of live female spiders. Jumping spiders have better eyesight than any other terrestrial invertebrate, so they could actually watch, and react to, the videos on a monitor. This was back in the late 1980s, so Dave dubbed his lab "MTV" for "Maevia Television." The Dimorphic Jumper is a species commonly encountered in the eastern half of the U.S. where it prowls understory foliage, climbs on walls and fences, and occasionally enters homes. 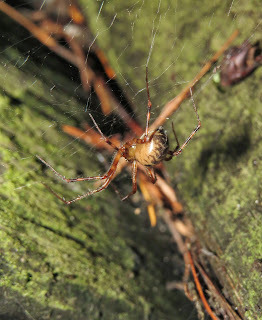 These are not overly large spiders, males ranging from 4.8-7.0 millimeters in body length, females 6.5-10 millimeters. Females have consistent markings, being mostly pale with a pair of orange or red racing stripes running down the back of the abdomen. The first time I saw a tufted form male of this species, it was on a sidewalk in Cincinnati and I initially mistook it for a carpenter ant. This species is not generally considered an ant mimic, but considering that carpenter ants forage in the same places as Maevia, it is not out of the question I suppose. So what was the result of those experiments? The dance of the black form male is apparently more successful at attracting the attention of a female from a greater distance, while the dance of the gray form male is better at wooing a lady spider closer to him. You can see videos here on YouTube of both kinds of males performing. There is no word on whether the females presented with the wrong combo of male appearance and dance moves suffered psychological damage. "Is there a female down there?" Sources: Bradley, Richard A. 2013. 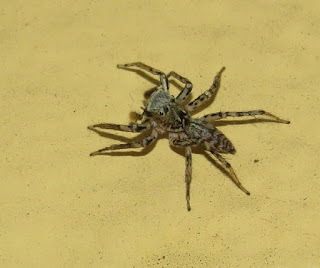 Common Spiders of North America. Berkeley: University of California Press. 271 pp. Clark, David L. and George W. Uetz. 1993. "Signal efficacy and the evolution of male dimorphism in the jumping spider, Maevia inclemens," Proc. Natl. Acad. Sci. USA 90: 11954-11957. Guarisco, Hank, Bruce Cutler, and Kenneth E. Kinman. 2001. "Checklist of Kansas Jumping Spiders [illustrated]," Kansas School Naturalist 47(1). Moffett, Mark W. 1991. 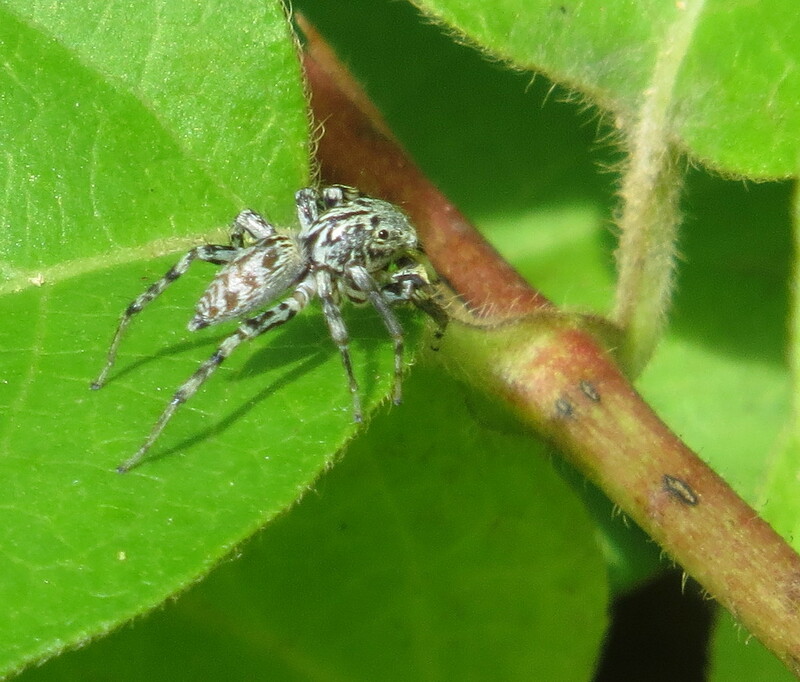 "All Eyes on Jumping Spiders," Nat. Geo. Mag. 180(3): 42-63. 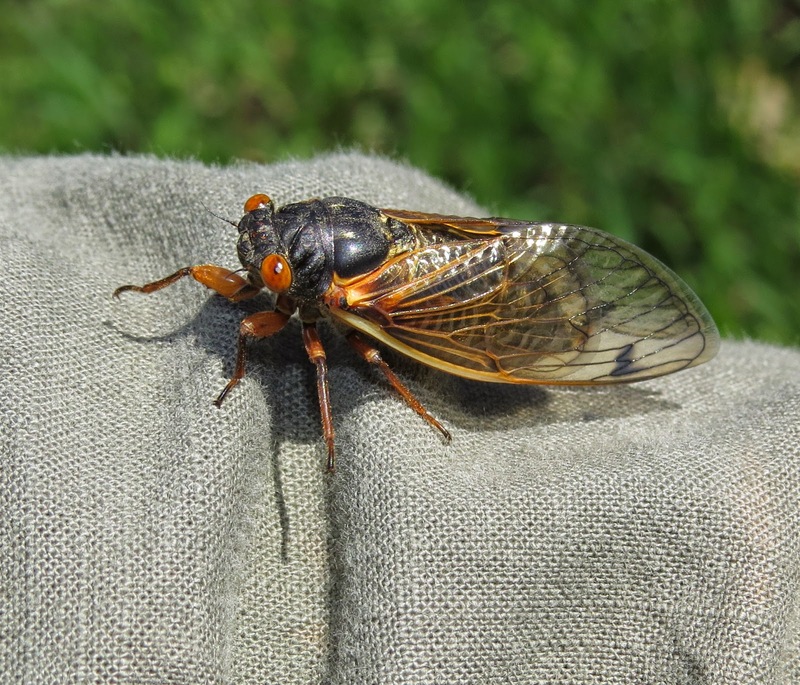 My wife and I scheduled our recent visit to see her parents in Leavenworth, Kansas specifically around the time when Brood IV of the periodical cicadas (Magicicada spp.) would be emerging, singing, and laying eggs. By all historical accounts, we should have timed it almost perfectly. Unfortunately, brutal weather turned that particular goal into an almost total bust. At any given locality in the eastern United States, Magicicada emergences happen only every 13 or 17 years. 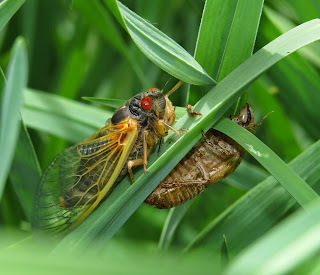 Scientists remain puzzled by the potential reasons for such a sporadic, synchronous spectacle in which millions of cicadas erupt from their underground lair to shed their youthful exoskeletons for winged adulthood. Different populations of periodical cicadas, also known as 17- or 13-year "locusts," have been assigned Roman numerals denoting "broods." Each brood has an emergence on a thirteen or seventeen year cycle. The thirteen-year cicadas typically range in the south, while seventeen-year broods occur mostly in the north. There is usually more than one species represented in each brood. This is an extra-special year because both the 17-year Brood IV and the 13-year Brood XXIII are emerging. This happens once every 221 years. Brood IV ranges from southwest Iowa and southeast Nebraska through western Missouri, Eastern Kansas, much of Oklahoma, and extreme northern Texas (eastern half). Brood XXIII emerges from Illinois and southwest Indiana to Louisiana, following the Mississippi River valley. 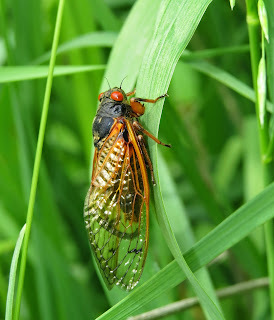 Initial observations of periodical cicadas by early settlers in 1633 were rife with errors. Those mistaken beliefs were repeated in a 1666 English publication. The only such massive appearances of a single kind of insect that the colonists were familiar with were plagues of migratory grasshoppers, so they assumed that the cicadas, too, were "locusts," hence the incorrect label that has persisted to this day. Cicadas are actually true bugs in the order Hemiptera, suborder Auchenorrhyncha. Leafhoppers, treehoppers, and planthoppers are all related to cicadas. They all have piercing-sucking mouthparts with which they tap plant juices for food. Despite their overwhelming numbers, periodical cicadas do remarkably little damage in either the nymph or adult stage. Damage to trees occurs when the female cicada forces her spear-like ovipositor into a twig or branch to lay her eggs. She does this with enough force that it can snap the twig, causing the foliage beyond the break to die and turn prematurely yellow or brown. This phenomenon is called "flagging." It also occurs when more than one female oviposits in the same twig. Tiny cicada nymphs hatch from these eggs and plummet to the ground where they immediately dig into the soil. There they will spend the next thirteen or seventeen years (depending on the species), feeding on the roots of trees, shrubs, and other plants. At the end of their underground life they surface, sometimes erecting "chimneys" above the surface of the soil. They clamber out, and up the nearest vertical object. Their front legs are like grappling hooks, and they secure themselves to the object. 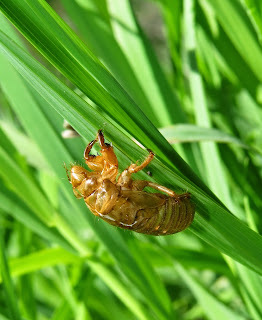 The exoskeleton then splits down the back and out comes a fledgling adult cicada. It is white, with patches of black across the thorax, and bright red eyes. The wings inflate in a matter of minutes, but it takes hours for the new exoskeleton to harden and the black and orange pigments to fully manifest. 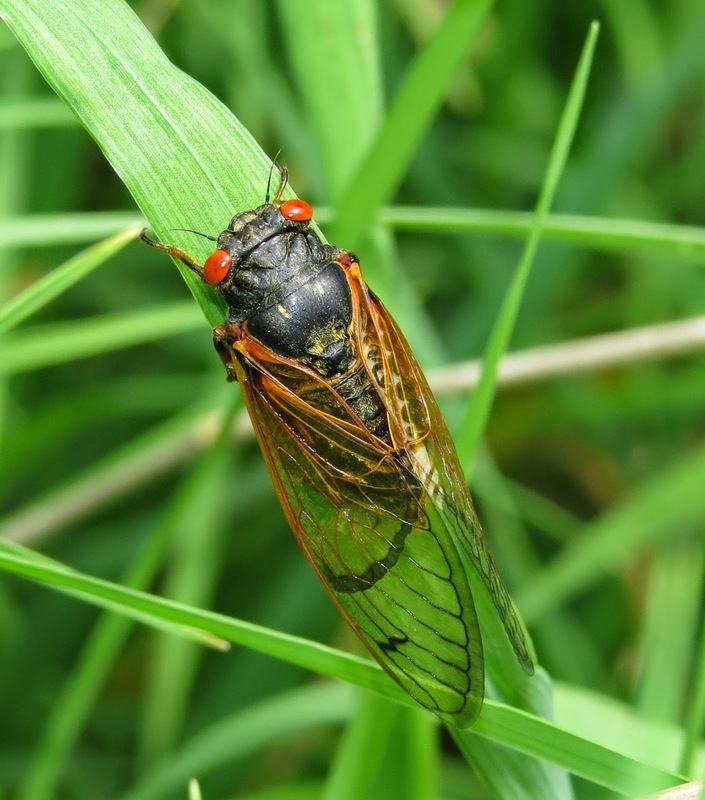 Male cicadas have a pair of percussion organs inside their abdomen, and opening on the underside of the insect. They can generate a very loud "song" in this manner and, obviously, the more cicadas the louder the concert. The adult insects live just long enough to procreate before falling victim to predators, a parasitic fungus, sheer exhaustion, or old age. There are three species of Magicicada with a 17-year cycle, and four species with a 13-year cycle. One of these thirteen-year species, M. neotredecim, was only discovered in the year 2000. The songs of the different species differ perhaps more than the physical appearance of the insects. When we happened upon Brood IV in northwest Missouri, the emergence had barely begun. We saw numerous shed exoskeletons, but found only four or five adult specimens, one only hours old. Meanwhile, there was evidence of rampant predation by birds. There were wing fragments everywhere. What a disappointment. Only a week later, I am receiving reports from friends that the emergence has finally overwhelmed mortality factors, and males are forming choruses. I have no idea when I will get another opportunity to document a Magicicada brood in the manner I want to for all of my readers here. 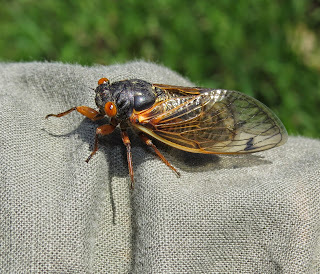 Thankfully, there are plenty of other resources online, including the "Cicada Mania" website, the "Periodical Cicada Page" produced by the University of Michigan, and "Cicada Central,", a project of the University of Connecticut. Among the more unusual insects to be found in the average home or workplace are the Firebrat and various kinds of silverfish, order Zygentoma, family Lepismatidae. They barely resemble insects, and are so primitive in their supposed evolutionary origin as to qualify minimally as part of the class Insecta. Siverfish and firebrats were formerly classified in the order Thysanura, along with jumping bristletails, but due to the confusing nature of Thysanura (at one time it even included springtails), the order name reverted back to Zygentoma, as originally established by Börner in 1904. Members of the order, and the family Lepismatidae, are easily recognized by their flattened, torpedo-shaped bodies, with long antennae, and three long filaments issuing from the tip of the abdomen. The long appendages often break, however, and specimens without the hallmark "tails" often confound the homeowner who finds one. The bodies of these insects are covered in short hairs and scales, which make them as slippery as a fish when a predator, or person, attempts to grab one. There are nine genera (plural of "genus") with about fourteen species, in the family Lepismatidae in North America north of Mexico. Some domestic species are cosmopolitan in distribution, having been carried to the far corners of the globe in international commerce. 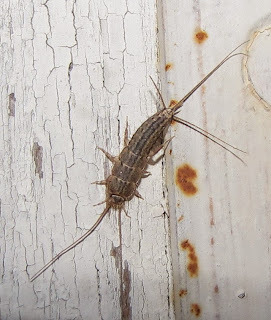 Among our common species are the Silverfish, Lepisma saccharina, Four-lined Silverfish, Ctenolepisma lineata, and the Firebrat, Thermobia domestica. Collectively, they range from 8-15 millimeters in body length. 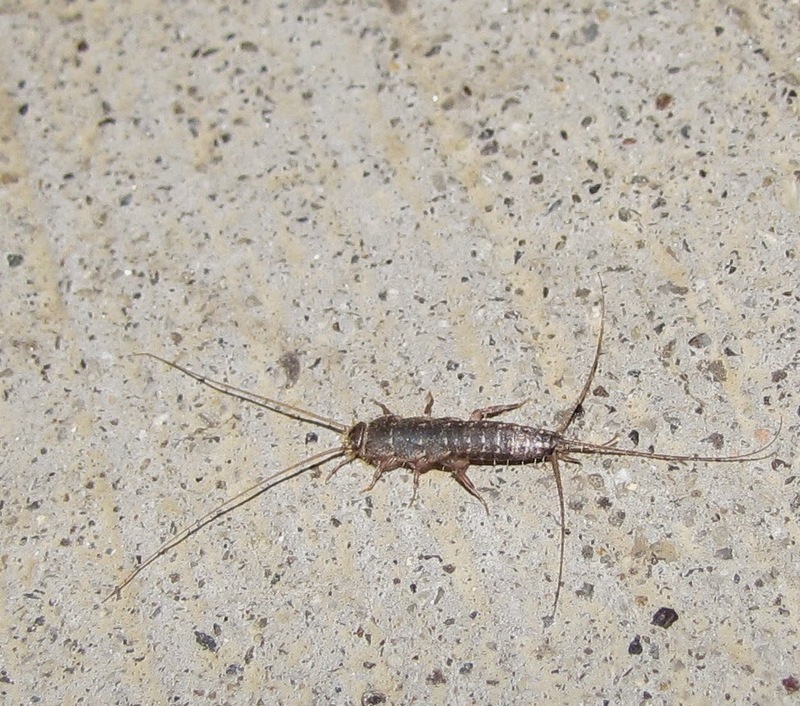 The rear-end (caudal) filaments and long antennae make them appear even larger. 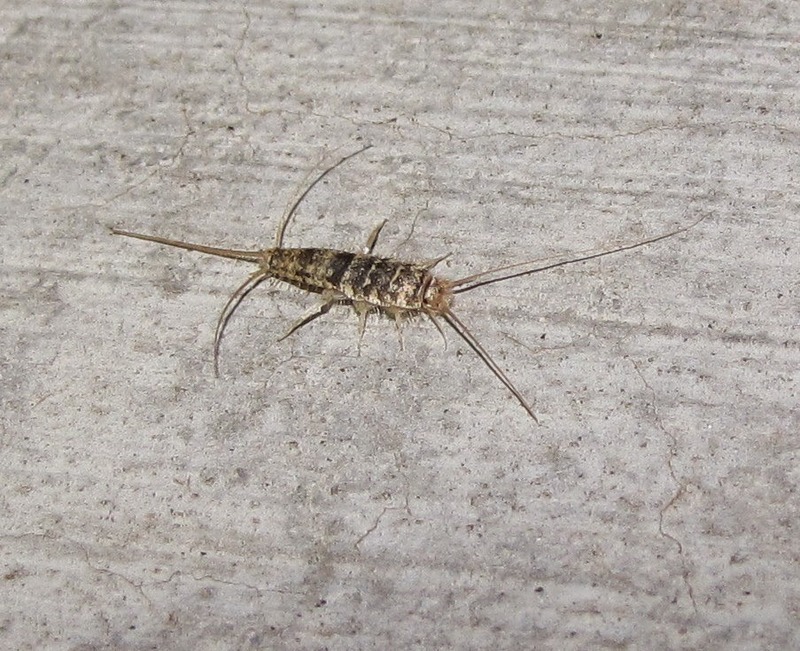 The Firebrat tends to prefer warm, dry situations, such as around furnaces and the insulation around water pipes; silverfish enjoy more humid surroundings. Lepismatids are typically nocturnal, hiding in nooks and crannies by day. They can run nearly as rapidly as a cockroach when startled. They feed on all manner of carbohydrates, with a particular fondness for starchy materials. Among their favorite meals is the paste used in bookbinding. Consequently, they can be an occasional pest in libraries, warehouses, and storage facilities, especially those without climate control. Got wallpaper? Maybe not for long, as the paste adhering it to your interior is fair game. They also eat starch in clothing, particularly when on silk and rayon fabrics. Oatmeal, damp wheat flour, and cereals are also on the menu. 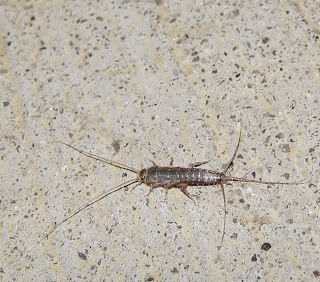 Silverfish and the Firebrat live a surprisingly long time: at least two years under laboratory conditions. They go through incomplete metamorphosis, the young stages resembling the adults but not being sexually mature. They molt a number of times to reach adulthood, but then they keep molting the rest of their lives. 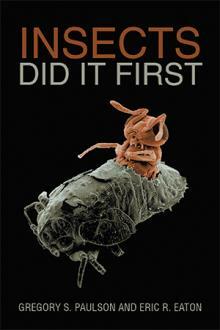 At least one specimen in the lab molted over forty times in a 2.5 year lifespan. Perhaps the molting replenishes the scales lost in the course of squeezing into crevices or slipping through a predator's jaws. Because of their ancient lineage, lepismatids do not mate with internal fertilization. Instead, a male lays down a packet of sperm called a spermatophore when near a female. He then binds her loosely with strands of silk spun from glands in his mouthparts. Thus restrained, she has little choice but to pick up the spermatophore and insert it into her genital opening. I know, it sounds like a sequel to Fifty Shades of Grey. She eventually lays eggs singly or in small batches in cracks and crevices. Thankfully, silverfish and the Firebrat are rarely abundant enough to be more than a novelty or a nuisance in the average dwelling, office, or other building. Should you feel compelled to control them, there are plenty of ".edu" websites that offer cultural, non-chemical, and chemical solutions. You might simply prefer to let predators like the house centipede do that job, though. What? That freaks you out even more? Sources: Berenbaum, May R. 1989. Ninety-nine Gnats, Nits, and Nibblers. Urbana: University of Illinois Press. 263 pp. Von Frisch, Karl. 1964. Ten Little Housemates. New York: The MacMillan Company. 146 pp. 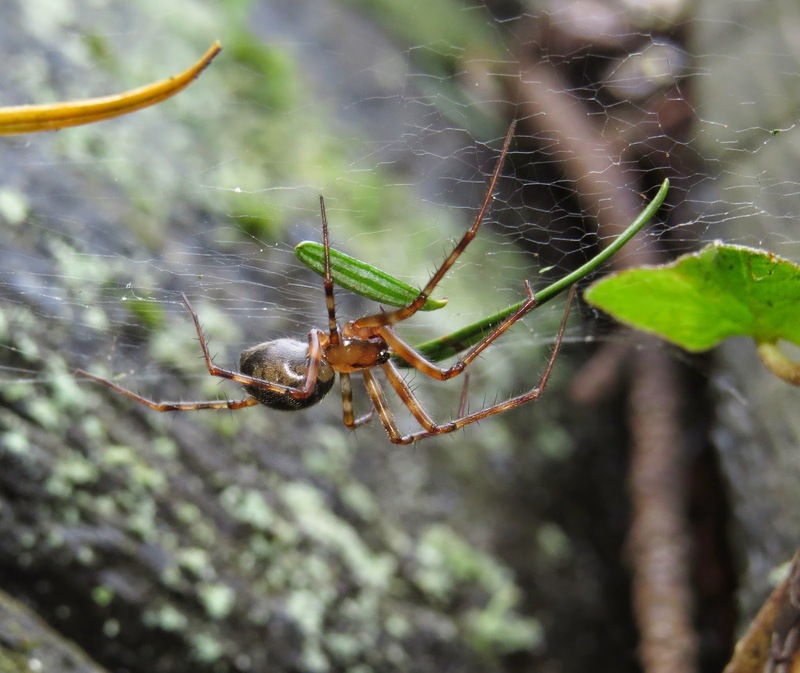 One of the spiders I vividly recall from my childhood in Oregon is a species of large hammockweb spider in the family Pimoidae, genus Pimoa. They were once part of the sheetweb weaver family Linyphiidae, but among other differences they are w-a-a-a-y bigger than your average linyphiid. The spiders themselves measure from 5 millimeters (males) to 12 millimeters (female) in body length. Their legs are pretty long, so they appear even larger. The common name could also apply to their webs. Sometimes they can span over one yard (yes, that's three feet). I have never seen a snare that large, and in fact, considering the size of the occupant, most webs are rather small, say no more than six inches across. Pimoids are found only along the Pacific coast of North America, the Cantabrian Mountains (Spain), Alps, and Himalayas. There are twenty-one known species of Pimoa, about 15 species in North America north of Mexico. 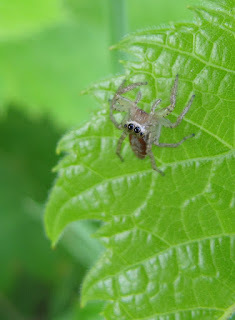 They seem to be spiders of the coniferous forests in the "rain shadow," at least from my experience in Oregon. 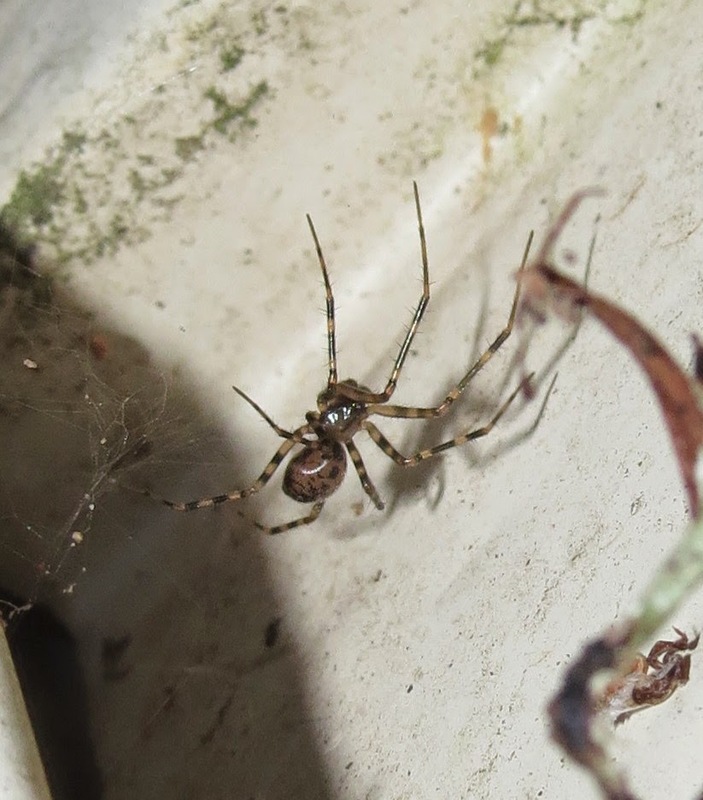 Look for their fine, net-like, horizontal webs issuing from crevices in logs, or, frequently, fences and retaining walls. It helps if there is a little dew. Otherwise the webs are surprisingly nearly invisible. The owners hide in a crevice or other retreat during the day, but can be seen hanging from the underside of the snare at night or even on overcast days. Females make nearly spherical egg sacs that they cover with debris as camouflage. The number of eggs varies from about 80 to 100. 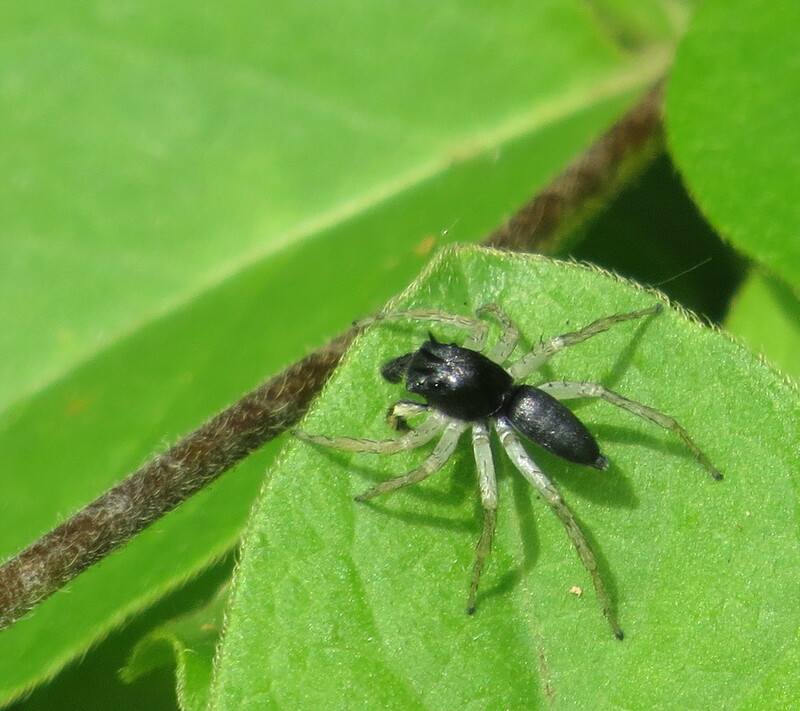 Like their relatives in the family Linyphiidae, large hammockweb spiders may break their legs off below the patellar (knee) segment to escape predators. This hardly compromises their agility, as you can see in the topmost image. 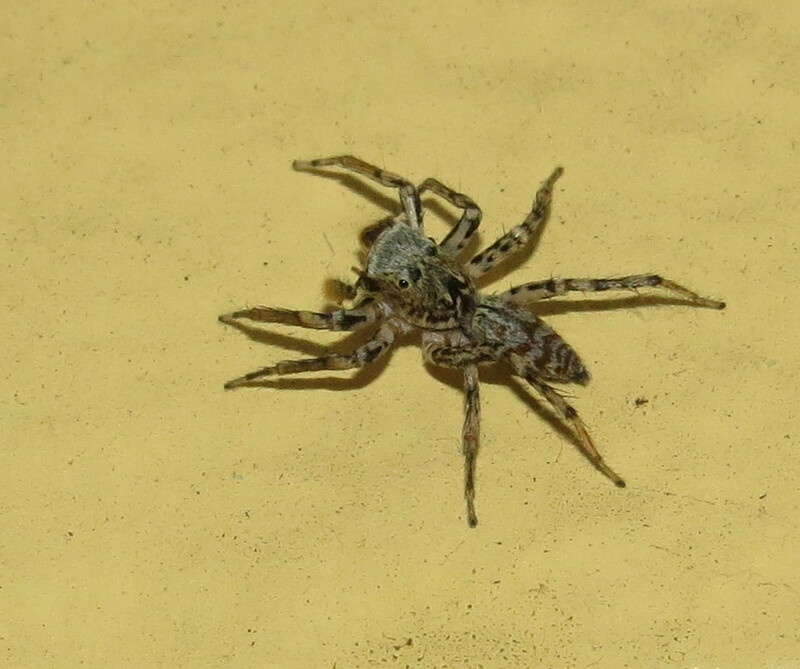 Next time you find yourself on the West Coast, take time to look for these interesting arachnids. I have to admit they are one of my "sentimental favorites." Hormiga, Gustavo. 1994. "A Revision and Cladistic Analysis of the Spider Family Pimoidae (Araneoidea: Araneae)," Smithson. Contrib. Zool. No. 549. 104 pp. 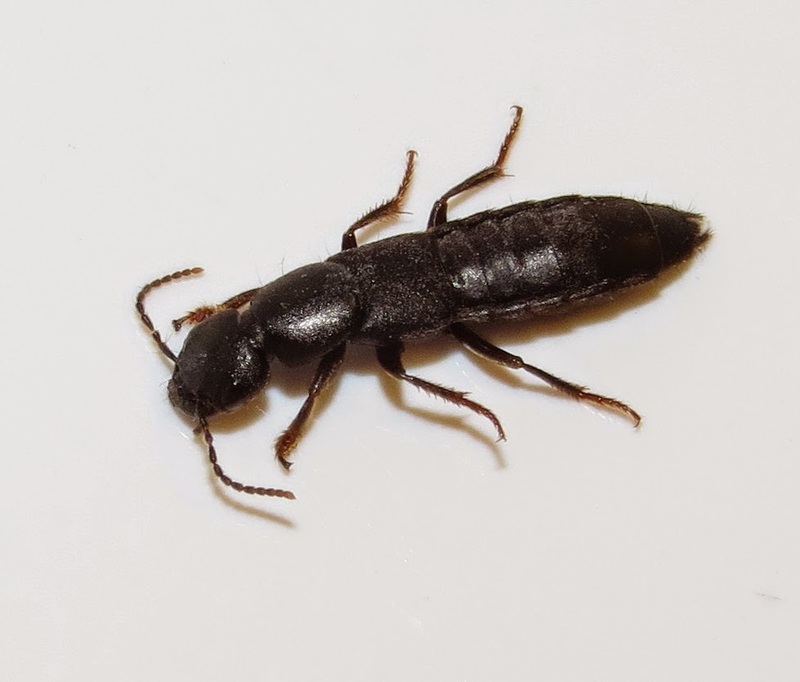 Exploring South Cheyenne Cañon the morning of May 2, I casually turned over a chunk of solid but rotten wood to find a large rove beetle clinging to it. Since I don't see staphylinids every day, let alone a large one, and because they typically move faster than your average insect, I bottled it up and brought it home to take a few images. Little did I know what would become of this innocent event. By the time I got around to putting the little fellow (it *is* a male, given the dilated front tarsi - expanded "feet") in my casserole dish staging area, he was clearly not in the best of health. 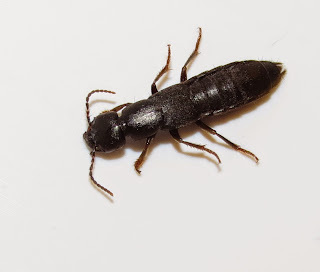 Rove beetles, family Staphylinidae, are well-known for secreting foul substances or odors in self-defense, and I wonder if he asphyxiated himself in the close quarters of the pill vial. Having limited familiarity with rove beetles, I accepted this was probably a native species of Platydracus, which includes many of our larger rove beetles. Just to be safe, I posted a couple of images on the Facebook group "Friends of Coleoptera at the Natural History Museum (Entomology Museum)." The natural history museum is the one in London, England, but the members of the Facebook group are from all over and collectively knowledgeable beyond measure. Not to mention courteous and kind. Well, in short order I had many "likes" for the images, and a few random comments suggesting identifications. None of them were Platydracus. Agmal Qodri didn't have an answer, but knew someone who might. "What's your opinion, Adam Brunke?," wrote Agmal. Before Adam could chime in, Harald Schillhammer offered that the beetle was "Tasgius winkleri or T. melanarius." Adam Brunke then concluded it to be Tasgius winkleri. Considering that most identifications of insects, let alone staphylinids which are among the most diverse of all insect families, hinges on minute characters like length and placement of setae (hairs), I was astounded to get a species ID from my images. There it was, though. What was perhaps helpful was the fact that this beetle is actually native to Europe, where of course it would be familiar to many members of the Facebook group. Alfred Newton filled in the blanks with his comment: "The range of this European species must be expanding - T. winkleri appeared on both east and west coasts of North America about 90 years ago, has spread westward as far as Illinois, but was not known from anywhere near Colorado." Wow. I did a little digging to find out more about this beetle and learned it was first reported on U.S. soil in New York in 1938; but it was probably present at least as early as 1931. Since then it has been discovered in the states of New Hampshire, Pennsylvania, Michigan, Illinois, Washington, Oregon, and California, plus the provinces of Ontario and British Columbia. Before 1987, this species went by the name Tasgius globulifer, which it turned out included the species T. melanarius, too. Such "splitting" of one species into two or more is the result of hard work by taxonomists who are alert enough to recognize character differences overlooked by their predecessors. 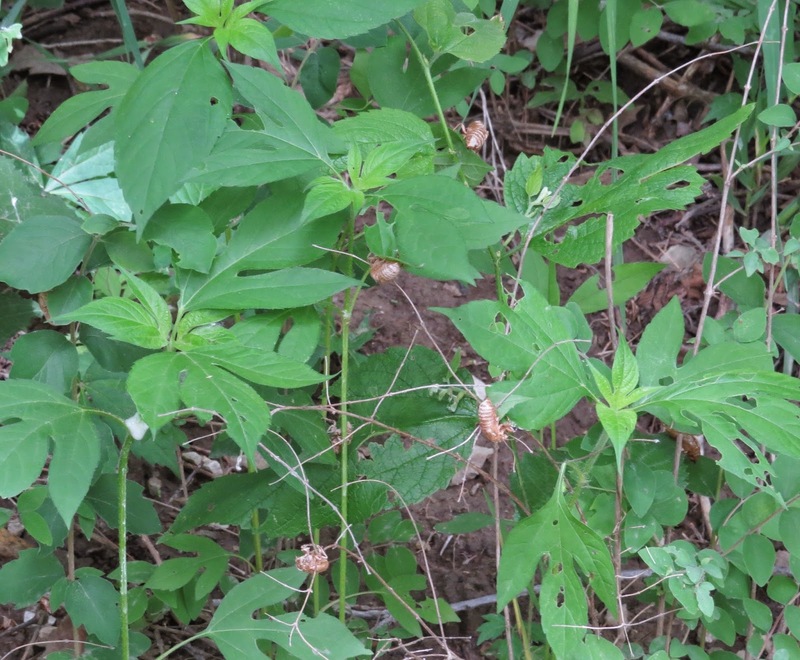 You might want to keep an eye out for this beetle in your neck of the woods. It is "synanthropic," meaning that it is seldom, if ever, found far from humans, and seems to thrive in habitat heavily disturbed by us Homo sapiens. So, look under stones and boards in your garden or neighborhood park, in leaf litter, the edges of wetlands, and similar moist niches. Source: Brunke, A., A. Newton, J. Klimaszewski, C. Majka, and S.A. Marshall. 2011. Staphylinidae of Eastern Canada and Adjacent United States. Key to Subfamilies; Staphylininae: Tribes and Subtribes, and Species of Staphylinina. 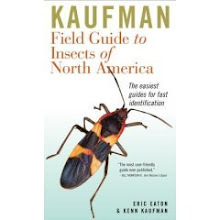 Canadian Journal of Arthropod Identification No. 12. Yesterday I came across an interesting little fly while exploring Cheyenne Mountain State Park, just south of Colorado Springs, Colorado. What I found interesting is exactly where I found them, but these are unusual dipterans in almost every regard. 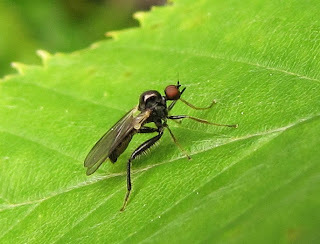 Most dance flies resemble small robber flies, and like asilids they are predatory as adults. Until fairly recently, all had been classified in the family Empididae, but the subfamily Hybotinae has been elevated as its own family now, especially by European scientists. We seem to be somewhat slower to adopt taxonomic changes here in the U.S. I would be tempted to call them "pinhead flies" because their spherical heads are so small compared to the rest of the body. 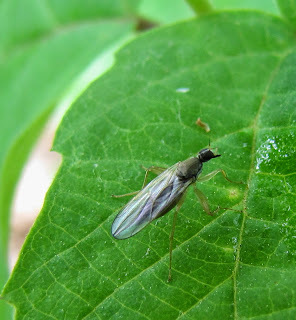 Many dance flies are restricted to specific feeding niches, such as tree trunks, the ground, on foliage, the surface of water, or in the midst of swarms of other kinds of flies. 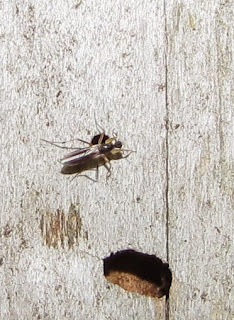 I found these particular flies on the inside walls of protected structures where park dumpsters are....well, parked. Makes sense. Garbage odors attract small flies and other insects that the dance flies would eat. Next best thing to a tree trunk, too, given there were few trees around. Hybotid dance flies are not very big. These were about 4 millimeters. Were I not familiar with the family, I might have mistaken them for some other kind of insect entirely, such as a true bug, especially given my deteriorating vision. Their vision must be quite keen, though, as the compound eyes take up most of the head. Dance flies seize prey with the front legs, which may or may not be modified for that task. At least some species seem to have bigger "biceps" on the front legs (the femur segment). The males of some species have modifications to the hind legs, too, perhaps to aid in grasping the female during mating. A proboscis inflicts the lethal bite, and then extraoral digestion happens as enzymes are injected and the resulting liquefied tissues of the prey are drawn back in. Precious little is known about the life cycle and biology of hybotids because they are of no economic consequence. We know the larvae of most dance flies seem to be predaceous as well. Some are aquatic or semiaquatic, others terrestrial, occupying microhabitats like leaf litter, dung, fungi, roots, even an owl's nest in at least one case. Why the name "dance fly," you ask? This is derived from the mating swarms of males of many species. They gather in clouds over prominent objects, each individual seeming to bounce or "dance" in mid-air. 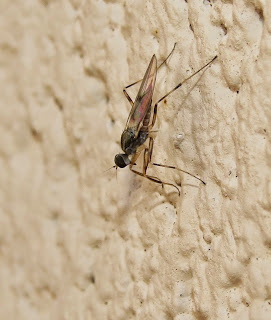 Many other flies do this, notably midges, but empidids got the moniker. Dance flies are particularly abundant right now, in spring, so keep your eyes peeled for them. I know, if only you had their field of view! Sources: Cole, Frank R. 1969. The Flies of Western North America. Berkeley: University of California Press. 693 pp. McAlpine, J.F., B.V. Peterson, G.E. Shewell, H.J. Teskey, J.R. Vockeroth, and D.M. Wood. 1981. Manual of Nearctic Diptera Vol. 1. Ottawa: Agriculture Canada. Monograph No. 27. 674 pp. (available as a PDF online).